A while ago, we were telling you about the infamous “zombie ant fungus” – a parasitic fungus that reproduces by manipulating the behavior of ants. It’s one of the most gruesome acts in nature – the parasite fungi infect tropical ants, literally taking control of their actions, ultimately leading the infected ant to march to its death at a mass grave near the ant colony, where the fungus spores erupt out of the ant’s head so it can spread even further, infecting more ants. Now, a new study has shown that the fungus knows how to differentiate between ant species, emitting mind controlling chemicals only when it infects its natural target host. Zombified ant – image via Wired. The finding suggests that the fungus “knows” its target, offering more light into this rather poorly understood phenomenon. 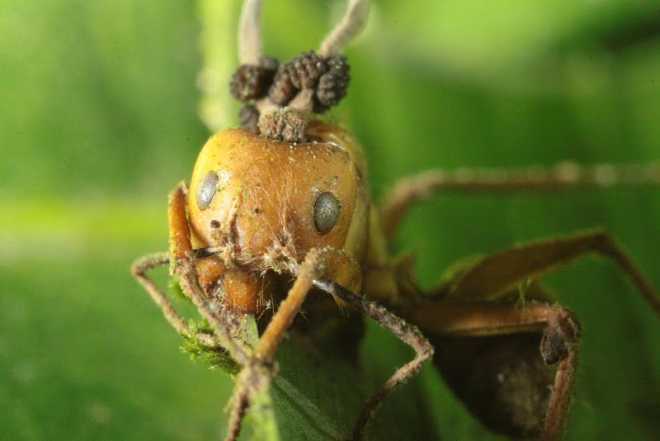 The Ophiocordyceps fungus infects many species of fungus, so it’s quite curious that it only exerts its mind controlling abilities on one of them; even though it infects and kills other species as well, it can’t influence their behavior. “The brain of the target species was the key to understanding manipulation,” de Bekker said. In order to figure out how this works, they removed ant brains and artificially kept them alive in the lab, exposing them to the fungus. “This was ‘brain-in-a-jar’ science at its best,” said co-author David Hughes, assistant professor of entomology and biology, Penn State. “It was necessary to reduce the complexity associated with the whole, living ant, and just ask what chemicals the fungus produces when it encounters the ant brain. While analyzing this interaction, the team found thousands of unique chemicals, most of them completely unknown to science. “There is no single compound that is produced that results in the exquisite control of ant behavior we observe,” de Bekker said. “Rather, it is a mixture of different chemicals that we assume act in synergy. Furthermore, they also found that this phenomenon isn’t restricted to the tropical areas, as initially proposed – it also happens in North America.